December's bonus recipe for the HBin5 group was picked by Jeff Hertzberg, one of the co-authors of the "Bread in Five Minutes a Day" books. 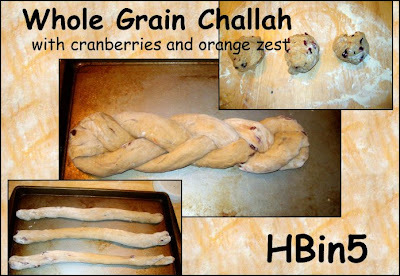 He chose Whole Grain Challah with Cranberries and Orange Zest. Sounded promising and yummy and as a bonus in my book, used three eggs. (We're only getting around 9 eggs a day now--down from 12-15 as the weather has cooled off some. Egg recipes anyone?) I had to pick up some wheat germ, dried cranberries and an orange to zest. After I bought my wheat germ, I read many others seemed to be substituting for it, but I got mine at the bulk foods store for just over under $2/pound. I considered using dried orange peel, but decided to stick with the recipe and bribed Ivy into zesting the orange for me. I mixed the dough on Monday with the usual help from Finn. I wanted to get it done while he napped, but the opportunity passed too quickly. So as soon as I tied my apron on, he was demanding to assist me. He has named the utensils for stirring things up. He calls the spoon, "Scoop" and the whisk "Dizzy"--references to Bob the Builder. I measure the ingredients and he dumps them into the container. Then he takes the measuring cups and Scoop and Dizzy and plays with mixes the dry ingredients. Ivy had to get in on the fun and make a slope for me to dump the wet ingredients down. 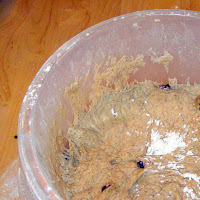 This didn't go as planned and wound up with me dumping about a cup of the wet mix on the table instead of the container since I had to try to pour as close to the edge as possible... Finn stirred a bit more, protested when I didn't let him take any dough out to play with, and protested louder when I returned him to the living room. I decided to try making a loaf that evening before the dough was refrigerated. After about two hours, I had a very nice rise in the container and pulled off a piece about a pound or so and put it in a loaf pan. After it rose again, I brushed it with an egg wash and sprinkled with raw sugar. Finn busied himself distributing leftover dragonberries (cranberries) through the living room. It's great to have a helper, let me tell you! The alarming rate at which the loaf disappeared attested to it's good taste. The orange zest did add a delicious flavor to it. Ivy and I both thought it reminded us of raisin bread and decided it would be good with an addition of cinnamon or perhaps rolled up with a cinnamon sugar mixture. It looked fairly simple, but I don't think I need to elaborate on how things that look simple can turn out. But lo and behold, it was simple! I worried about how the dough would be to handle, but with a little flour, it was really no problem. I divided my dough into three pieces, rolled/stretched each piece into a long snake, and then braided them like I was braiding hair. I pinched the ends together a bit and covered it with a towel and left it to rise. Before I put it into the oven, I brushed it with an egg wash and gave it a sprinkle of poppy seeds. I realized after I got the bread into the oven that I didn't let it rise as long as recommended. 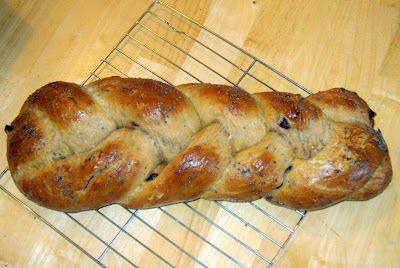 It still smelled tantalizingly good as it baked and looks pretty good for a first-time braider, I think. I haven't tried it yet--I almost hate to cut into it. I feel so accomplished looking at this loaf. I used to think it required special skills to make such a fancy bread--but obviously it doesn't!! 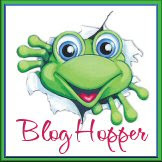 Check out what others did with this month's recipe at the HBin5 Bread Braid. With the remaining dough, I want to try making some croissants, but what I really wanted was to tuck a surprise of chocolate into the center of each croissant and I forgot to get chocolate when I went shopping yesterday. I did get some white chocolate chips, though--I bet that would be good, too. And as a parting hurrah, when I went to check the Bread Braid this morning, I found I had won a prize! 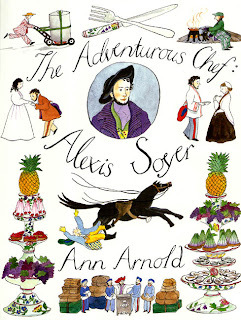 I won a copy of this book by Ann Arnold about Chef Alexis Soyer who was a chef in 19th century London. Looking forward to reading this with the kids. I love waking up to surprises like this! Nice tutorial on your braiding experience and I enjoyed the video too! So happy that you had fun with braiding the Challah! Gorgeous loaf! The book is going in the mail today! Lovely bread! And a wonderful book! What a lovely braid. I thought it rose very nicely. Congrats on your prize! This looks delicious. I always feel so accomplished after baking a new bread...its like a natural high. Your braid turned out great! I like your idea of sprinkling poppy seeds on the top too. congrats on the book win!! and your bread looks wonderful. That looks so good. Happy Holidays!!! I love your challah- the shine is beautiful. Nice video. Let's not do that again, shall we?